I see so many people who love Studio Calico. So I decided to get a Studio Calico 6x6 paper pad and see what all the fuss was about. It's different than the bright pattern paper I'm typically drawn to so I wasn't sure how I would feel about it (although I'm not very good about using the bright pattern paper anyway). Turns out, I love it! I used a few of the patterns from the Autumn Press pad along with some Lawn Fawn to create this simple birthday card. I think the color palette is just lovely. I used Bisque Liquid Pearls and Rock Candy Distress Stickles for my accents. And it seems I am incapable of making a card without some twine or ribbon, so I added a little of that as well. :) I'm looking forward to using some more of the lovely papers in this pad. I also got some Mister Huey's too and I'm looking forward to trying those out as well. Thanks for stopping by today. I hope you all have some fun things planned for your weekend. Me and the hubby are headed to a pumpkin carving party tonight and then hopefully the corn maze tomorrow night. The leaves are peaking and it's a Fall-tastic weekend here in the mountains. beautiful card. 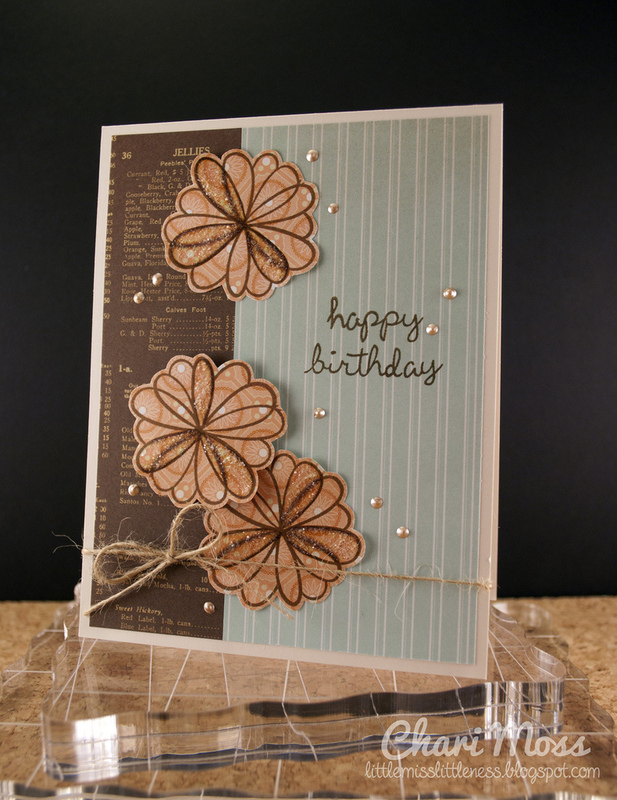 Love the muted tone with the pretty LF flowers and the liquid pearl accents are GREAT! really pretty card!! That Bisque coloured Liquid pearl is gorgeous! I used to be the same about Studio Calico--'where's the bright?!' but i love 'em too now! this is lovely. the color scheme is so pretty...love the peach flowers on brown. Love this card! The color of those flowers is beautiful, and the pearls/stickles are a great accent. I've managed to resist the paper so far, but it is on my wish list! Holy moly Chari you have been a busy girl this week!! I have loved everything, and now I HAVE to buy Sally's ABC's. Too cute. Also, I LOVE that Studio Calico paper. So soft and pretty. How cute is this?! I love the patterns you used in the background! Yes, I love this. Love the tones, which are perfect for this season.... And then little shots of bling is perfecto.